Klondike’s world will mesmerize you with its great graphics and interesting gameplay. The Blue Peaks Valley is full of colors and the surroundings are full of plants and wild life. Even the buildings have a distinct architectural style. All of this helps you immerse yourself into a world of adventure and excitement. During the game, players will experience wild lands of Alaska and encounter the good hearted indigenous nomadic people of the Far North as well as the tough-as-a-rock gold-miners. This beautiful but dangerous land of snow-capped mountain tops, deep valleys and thundering waterfalls is not only a world to explore, it’s also a stage on which players will try to uncover a mystery that forced our character to make Klondike his new home. A mystery that is the fate of the lost expedition of the main character’s father - a gold-miner. To find your father’s expedition you will have to face challenging tasks including building a prosperous settlement, funding your own expedition and exploring unknown regions of Alaska. To successfully manage a settlement you will have to show your skills in farming plants, breeding and keeping animals, trading and exchanging goods and hiring extra help. To speed up your work, you can hire local Invites or friends to assist you in nearly every task. All this will help you to prepare your own expedition. The more successful your settlement, the better equipment you can buy and the further you can explore. During their exploration players will travel through a vast and amazing world, encounter and uncover new locations, resources, treasures and much, much more. As players progress with the game each quest will take them one step closer to solving mystery of their father and his lost expedition. But fear not, if you do not have the resources and need to discover unknown regions of Alaska you can always explore terrain that belongs to your friends and in that way earn some extra money and uncover bonus resources. 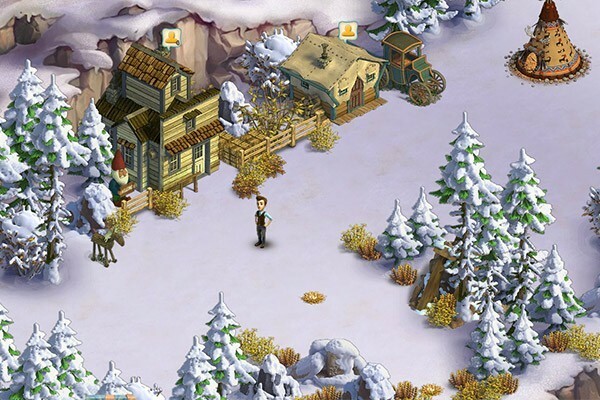 Klondike is a unique online game that combines aspects of a economic, simulation game with adventure and exploration. There are two distinctive elements in the game. First is creating a foundation, this includes town building and taking care of your surrounding farm. This includes simple activities such as clearing the bushes and stones and chopping trees for resources and space (sometimes also occasional treasure). 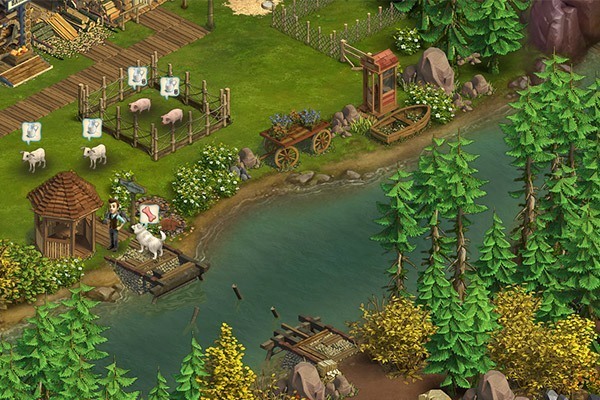 Players also need to be ready to do more complicated tasks, such as taking care of gardens, harvesting plants, plowing the land, breeding animals and more. But that’s not all! 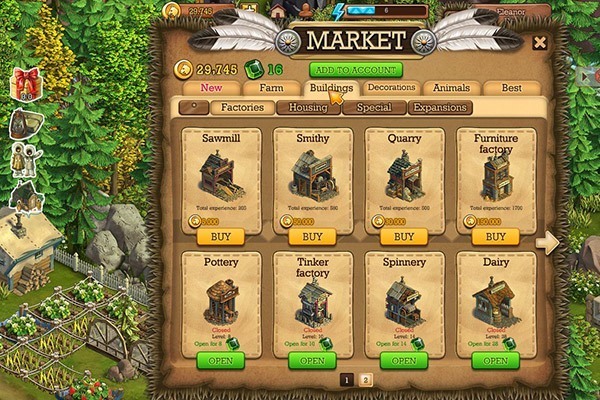 To ensure success players need to build houses and other accommodations for workers and buildings for more industrial purposes (such as a lumber mill). On top of that there is a trade element in the game as you can exchange goods with your friends. The second distinctive part is exploring and discovering new locations. This is an exciting travelling and adventure element in the game. Furthermore, it is directly tied to the game story as the player tries to uncover the fate of his father. Each expedition needs careful planning and specific resources before it can be executed, Alaska is a dangerous place, so be warry and always prepare as best you can before taking this step. 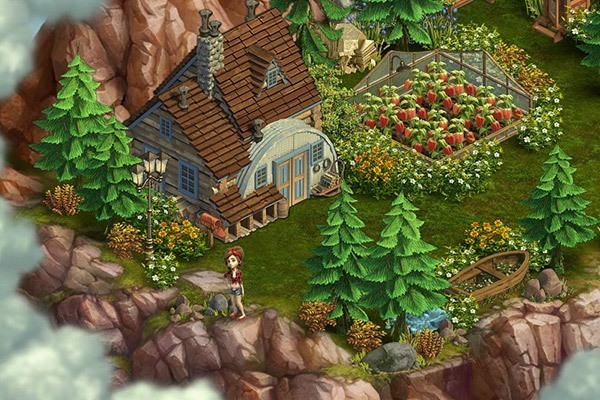 A safer way to travel into new locations is visiting your neighbor’s land, where players can also do some exploring and find much needed materials and even treasures. As stated above, it is not an easy task, first there are money and resources needed and then you have to choose which method you will use. At the start, players will probably travel Klondike using dog sleds. Sleds and dogs can be improved (for a price) to reach further. The second option is taking a plane and flying above new lands fast and in style. Players also decide if they will make their expedition a permanent settlement or only temporary stations. Timed locations always have a certain purpose, a task that needs to be done in a certain amount of time. Once this is done players will receive a prize from that location. This type of expedition provides players mostly with new raw resources needed for the expanse of their home-base. The second type of expedition, the permanent type, is actually tied to the main storyline. In this land you will have new quests, new buildings, storage and trading places. It is good to remember that those types of location are more important in the long run. As you can see Klondike is a world of possibilities, a world that is waiting for you with open arms, log in and join the game! Looking for new challenges? We recommend other, free online games such as Poker Hold'em Live Pro, Bingo, Pool Live Pro, Snooker Live Pro, Pool 8 and many more.